Pretty cards—in an instant. 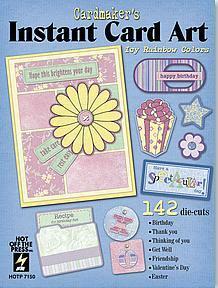 Cardstock die-cut focals take the work out of card making, so you can have the fun! You’ll have enough beautifully coloured, illustrated die-cut quotes, messages, tags and accents to create 17 different cards—all totally colour-coordinated in fresh, pretty colours like mint green, ivory, vintage pink and periwinkle blue. Use the included card samples for inspiration, or make up your own. Themes include Mother's Day, Sympathy, Thinking of You, Birthday and more!